﻿ Cristiano Ronaldo: "I would bet my money on either Portugal or Spain to win the EURO 2012"
07.06.2012 » CR7: "I would bet on either Portugal or Spain to win the EURO 2012"
Cristiano Ronaldo has revealed that if he had a suitcase full of money to bet on who will win the EURO 2012, he would put his cash primarily on Portugal, but then immediatly on Spain. Contrarily to what many certainly expected, Ronaldo had no problems in considering the Spanish National Team as the main favorites and said that Portugal will try to do the best possible, having in mind the resources they have available. The 2nd part of Cristiano Ronaldo's interview to "MARCA", has come out this Wednesday and this time, most of the topics being covered concerned the EURO 2012. The Real Madrid forward has left big praises to the Spanish National Team, who he regards as one of the main favorites to lift the trophy in a few weeks. In Ronaldo's opinion, the Spanish side is so strong that they could even compete with two different teams and both would have good chances to win the EURO 2012. 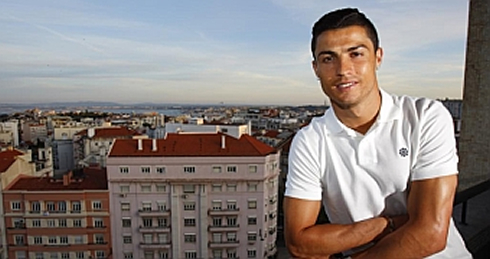 As for Portugal chances, CR7 is confident that his team will also have a word in the quest for European glory and hopefully, make it to the final of Euro 2012. In order for that to happen, the Portuguese "Selecção" will have to get through this tournament's "group of death", where they will be put against Germany (June 9), Denmark (June 13) and the Netherlands (June 17). Cristiano Ronaldo: "Yes, but that's the way things are. It's true that it's going to be really hard, but we can't mourn about it. We have to get 5 or 6 points to get through and that's our priority. It's going to be difficult, but not impossible!" MARCA: The Portuguese National Team coach, Paulo Bento, seems to be trying to remove some pressure from you. A few days ago, he said that he's not expecting for you to solve every problem that may lie upon the team, but what ends happening is that you're the one being the most demanding about yourself, right? Cristiano Ronaldo: "Well, I just try to do my job in the best possible manner. In the eyes of the public, or at some given moment, it's possible that people may think that I'm carrying more pressure than others, but that's not what really happens. This is just the way I am and the way I like to play. I'm very aware of my responsabilities and because of that, it's natural that one time or another people can get that idea from what they see, even though it doesn't correspond to the reality. I'm truly happy, both at the Portuguese National Team and Real Madrid. I feel no excessive pressure at all." MARCA: Despite your opponents being very tough [Germany, Denmark, Netherlands], Portugal does have a set of players that can make the difference against any team, as it is the case of Pepe, Raúl Meireles, João Moutinho, Nani or Ronaldo. Cristiano Ronaldo: "Yes, I'm optimistic about our chances, like always. We have good players with a lot of ambition and who are excited to put some good performances on this EURO 2012. The circumstances are great, because we are not seen as favorites and that allows the team to deal with a lot less pressure. We just have to enjoy playing our football on the pitch. There are several teammates of mine who will be living their first experience in an European Championship, so I'm sure they'll make the most out of it." MARCA: You've already been very close to win a tournament like the EURO... moreover playing at home [EURO 2004]. Cristiano Ronaldo: "Yes, back in 2004! It's been a long time already, 8 years and we were so close to win it... [Portugal lost in the EURO 2004 final played at home, in Lisbon, against Greece by 0-1, in what was called the "European Maracanazo"] Those are very sad memories, because we had the obligation to win that game in front of our own crowd. But that's football and we have to look ahead. Now we have to focus in Poland and Ukraine's EURO 2012 and we have to be optimistic!" MARCA: Your teammate at Real Madrid, Pepe, is one of the Portuguese National Team captains. Would you agree that he is on the best form of his life? Cristiano Ronaldo: "Yes, in my opinion and right now, Pepe is the best center back in the World. As a teammate, he's also the best you can imagine and a very good friend of mine. It makes me really happy to know that he is one of our captains, because he's also a leader in his own way. He has been helping us a lot on the pitch and he has shown repeatedly that he has a great Portuguese heart." MARCA: In Real Madrid, Pepe somehow earned the reputation of being an over aggressive player. What's your opinion on this matter? Cristiano Ronaldo: "That's not fair to him. When someone is as good of a player as Pepe, people always tend to look for flaws even though they're not there and that happens with Pepe and myself. He's not an aggressive player, I simply can't agree with that. He doesn't play with bad intentions and he's very loyal to his team. As a defender, he has to play the way he does. If I was a center back, I would play the same way Pepe does... I can't even state a single bad thing about Pepe, because from my point of view, there's nothing that stands out in a negative way." MARCA: What's your take on the current Spanish National Team? Cristiano Ronaldo: "They are favorites to win the EURO 2012, no doubts about that. They got one of the strongest sides and they'll have plenty of chances to make it to the final of Euro 2012." MARCA: Who do you think Spain will miss the most, a center-back like Puyol or a forward as David Villa? Cristiano Ronaldo: "Well, those are two players who were important for Spain when they won the 2010 World Cup. They'll both be missed, but other players will step up and they'll do it at a good level as well. That happens easily in Spain because they have a big group with great players. Vicente del Bosque could pick two different teams for this championship and both of them would have to be seen as candidates to win the tournament at the end." MARCA: What does Spain have that Portugal doesn't have? And in the other hand, what do you have in your team that the Spanish side could be lacking? Cristiano Ronaldo: "Listen, I'll be completely honest... Spain is a country which has roughly 50 million citizens. They have more people playing football, the best league in the World and it's where the best players play at. Some of those are even Spanish players as well, so that just says it all... What Portugal lacks is precisely that, which opens a lot more possibilities to be explored. We can build a competitive team in Portugal, but if two or three important players are ruled out, like Fábio Coentrão or Pepe, then we wouldn't have someone with the same level to replace them. We don't have another Pepe... In the other hand, in the Spanish National Team, if Puyol can't play then there are like 3 other players who can replace him without the team losing much quality." MARCA: Did you speak with José Mourinho in regard to the Portuguese National Team? Cristiano Ronaldo: "Not exactly... The coach has wished us good luck, because he'll obviously be supporting Portugal and because he also shares this love we have for our country. He always wants the best for us." MARCA: What about Ricardo Carvalho? He already confessed that he made a mistake when he decided to leave the Portuguese team some months ago, but after that incident, he didn't seem to have been able to play at the same level anymore. Cristiano Ronaldo: "The truth is that speaking about Ricardo Carvalho is something that makes me a bit sad for everything he has been through... Sometimes we make decisions which turn out to be mistakes and we'll get charged for it. Ricardo has made a mistake and there's nothing much we can do about it now. It's part of the past but it's something that leaves me very sad. However, I'm very happy for playing in the same club as him, because he's a great person and terrific football player. It's a shame that he can't be with us for the EURO 2012, because he has enough value to be included in this squad. These are decisions taken by the coach and the players just have to respect them. MARCA: Can you reveal what would be your bet for the EURO 2012? Which country will win the tournament and who will become the top goalscorer? Cristiano Ronaldo: "The winner... If I had a suitcase full of money, I could bet on Spain, why not? I'm not going to be hypocrite, but I would bet money on Portugal as well, no doubts about that. If that wasn't the case, I wouldn't even care to travel to Poland and to play in the European Championship. I have high hopes for our campaign and after Portugal, I would go with Spain for winning the tournament. Regarding to the EURO 2012 top goalscorer, I won't risk any prediction because this tournament is very short and everything can happen. Any player can score 2 or 3 goals in a single match and make it very hard to reach him in the standings. I wouldn't bet any money on this kind of bet!" MARCA: Throughout the entire interview, we couldn't help to notice that you always seemed very relaxed. You're already a proud father, but can we infere that you're also close to be a future husband? Cristiano Ronaldo: [Laughs] "Well, I'm very well in life at this stage. Being a father has changed my life, by giving me estability and allowing me to concentrate and focus more on my work as a football player. In a psychological level, that really changes you, just like having someone in your life [Irina Shayk], with who you can spend some good moments. So it's true, I'm more settled now and at my 27-years old of age, I'm on my career peak in both professional and personal levels." MARCA: To close this interview,	how are your plans going, in respect to becoming an actor after you end your football player career? 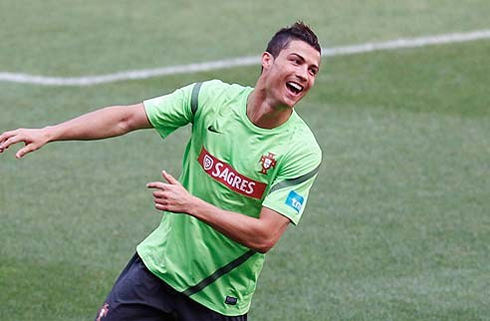 Cristiano Ronaldo: [Laughs] "I still want to play football for a few more years. After that, we'll see what happens... I still haven't planned what I'm going to do after football. This is what I do best. About other opportunities, we'll have to think about them in the future."